This book began in prayer and grew as a labor of love. During one of his daily prayer sessions, Pope Francis received an inspiration: to shine a light on the vital role of grandparents and other elders. He began to preach frequently about the world’s need to pay close attention to our elders and heed their wisdom. Pope Francis had previously responded to children’s questions in person and in the book Dear Pope Francis. In a new project, his focus turned to the grandparents, mothers, fathers, widows, widowers, and single individuals who have known decades of joy and sorrow, loss and change. Pope Francis views elders as reservoirs of wisdom and historical memory and believes their insights will offer future generations much-needed understanding and direction. Loyola Press eagerly embraced the Pope’s vision. We soon realized how complicated it would be to gather suitable stories from around the world. Elders, after all, don’t meet in schools every day as children do. In fact, the eldest in society are often in the background, invisible, silent. We needed help—so we reached out. We were greatly aided in that quest by many individuals, but two groups warrant special mention because of what they added to the project. Ten Jesuit publishers answered our call and helped us locate wise elders in the countries in which they publish. They interviewed contributors and translated and edited their stories, many of which appear in this book. We also partnered with Unbound (unbound.org), a nonprofit sponsorship organization that serves more than 300,000 elders and children in 18 countries around the world. They generously brought to the project a network of authentic, respectful relationships with elders and a corps of professional social workers, writers, photographers, translators, and editors who gathered stories of great honesty and vulnerability from people we would otherwise never have been able to reach. In July 2017, Loyola Press sent a collection of stories to Fr. Antonio Spadaro, SJ, our creative partner on this book. We selected stories that encompassed universal themes—recollections of love, loss, survival, hope, peace in the face of unimaginable tragedy, and above all, faith. Fr. Spadaro gave the stories and accompanying photos to Pope Francis. Then, in conversations Fr. Spadaro held with him over the course of three meetings, Pope Francis responded with sensitivity and grace to 31 of the stories and the issues they raise. Pope Francis played three roles in this book. In his Preface, he lays out the reasons that prompt his desire for this collection of wisdom stories and the movement he hopes it inspires. He also contributes as a fellow elder, offering a story from his own life at the start of each chapter to illustrate wisdom he’s gained on each of the five themes of the book. And in his own wise and compassionate way, he serves as a spiritual shepherd, commenting on dozens of heartfelt stories. Because Pope Francis has been eager to foster communication between the generations, the voices of the young are also represented in this book. We’ve included a feature, “What I Learned from an Elder,” in which a young person shares a valuable lesson learned from a grandparent, former teacher, or dear friend. Everyone involved in the editing and production of this book has taken great care to preserve the words and intent of the people who shared their stories. We also honored how they wanted to be identified or described. In some cases, names were changed and alternate photos were used to respect an elder’s privacy. We understood what a gift and act of trust it was for elders to share the most difficult, intimate, and loving moments of their lives, and we have sought to capture them faithfully. Over a year and a half, we interviewed more than 250 people. Not all stories could fit into the book, but no effort was wasted. 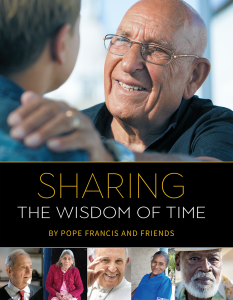 Every single contribution helped shape this book, which is Pope Francis’s gift of appreciation to all the elders of the world and to younger generations whose lives their wisdom may inspire. Given the nature of this project, it seems appropriate that the making of Sharing the Wisdom of Time was led by a veteran journalist approaching the end of his career and a young journalist bringing her fresh ideas and the perspective of someone who came of age in a digital world. The conversations between us have been honest, robust, and enlightening, and we trust that our shared vision has brought depth and richness to the project. We hope you will be as moved as we were by the people you are about to meet. A project of this magnitude involved the help of many hands. We are forever indebted to the global team who helped us gather the stories and images that make up Sharing the Wisdom of Time. That includes Unbound, a nonprofit sponsorship organization, who dove into this project with reverence and generosity and who were, quite literally, a godsend: Andrew Kling, Loretta Kline, Liz Espino Reynoso, Larry Livingston, Dora Tiznado, Gabrelle Wise, Gina Paola Moreno, Alley Stonestreet, Xander Jobe, Mary Geisz, Jordan Kimbrell, Maureen Lunn, Claudia Vázquez-Puebla, Joe Sundermeyer, Scott Wasserman, Regina Mburu, Tristan John Cabrera, Daniel Perez, Diamond Dixon, and the rest of the staff of Unbound, as well as their team in Colombia, Henry Flores and Mónica María Gómez Arias, who created an incredible immersion experience for Loyola Press staff members. Thank you, Elizabeth Hughes, for referring us to Unbound and for your support of this project. Our Jesuit publishing partners were also instrumental: Anja Celarec, Pat Coyle, Fr. Daniel Stevens, SJ, Juan Bernardo Ordoñez, Paulo Moregola, Milene Albergaria, Fr. Jerry Sequeira, SJ, Endang T. Lestari, Olaf Pietek, Edyta Drozdowska, Ramón Alfonso Diez, Tony Homsy, SJ, Stéphane Dupuis, Jean Hanotte, and Charles Delhez, SJ. A special thanks also to our early partners, Eddie Siebert, SJ, and Loyola Productions Inc. and Little Brothers – Friends of the Elderly. We also want to acknowledge all the individuals who connected us to elders, including Mateo Arteaga, Jan Benton, Flavio Bottaro, SJ, Paul Campbell, SJ, Sr. Sheila Campbell, MMM, Conny Caruso, Phyllis Cavallone-Jurek, Jan Celarec, Sr. Sheryl Frances Chen, OCSO, Joellyn Cicciarelli, Maria Cuadrado, Maria Dolores Enríquez de Guevara, Bridget Gamble, Julianne Gazal-Rizk, Ceci Greco, Antonia Guaci, Garrett Gundlach, SJ, Josephine Hathway de Orellana, Thomas Howard, Maria Infantino, Sunny Jacob, SJ, Elizabeth Kaye, Subhash Khandelwal, Heather King, Jane Knuth, Maria La Giglia, Terry Locke, Chris Lowney, Jim Manney, Peter McDonough, Margaret McGrath, Chris and Mike Morkin, Elizabeth Muir, Martha Nyagi, Mary O’Meara, Ehi A. Omoragbon, SJ, Fr. Vincent Pereppadan, Gaston Philipps, María Catalina Mūnoz Soto de Philipps, Enid Sevilla, Nikolaas Sintobin, SJ, Jennifer Smith-Mayo, Fr. Antonio Spadaro, SJ, Larry Sutton, Jennifer Tan, Joseph Thera, José Victoriano, SJ, Kevin Virostek, Rachel Zhu Xiaohong, and Maura Zagrans. Our sincerest gratitude goes to the man behind the camera, National Geographic photographer Paul Audia, whose gift for capturing the dignity and majesty of a person shines through in each of his photos. Many offered their help to him along the way, including Andrea Abenoza-Filardi, Aída Abu Orabi Alarcón, Lucía López Alonso, Ivana Audia, his cousin, Paul Audia, Thomas Boland, Guido Bonelli, Mark Brady, Ricardo Carlucci, Melinda Carney, Anja Celarec, Pat Coyle, María Dolores, Elias Archelia, Jason Filardi, Jordan, Maria Infantino, Magdalena González Parra, Katarzyna Hushta, Sr. Maria McCready, Fr. Jude Molnar, Julia Płaneta, Bonnie Reid, Łukasz Szczepaniak, Carol Tully, Giovanni and Giluia Vinciguerra, and Maura Zagrans. We also thank Luigi Faura, Tom Hopkins, Brigitte Lacombe, Lucy Lean, Jaclyn Lippelmann, Itânia Neri dos Santos, Ruby Rideout-Koprivica, Steven Sulewski, and Matthew Ryan Williams for their extraordinary photographs. We couldn’t have completed this book without a talented team of coordinators, editors, translators, and designers, including Donna Antkowiak, Kathy Burke, Fr. Louis Cameli, Elisa Ciaglia, Caitlyn D’Aunno, Joseph Durepos, Michael G. French, Becca Gay, Beatrice Ghislandi, Erica Jeffrey, Elizabeth Kennedy, Josef LaHood-Olsen, Serena Linguanti, Nikki Limper, Kevin McLenithan, Yvonne Micheletti, Bret Nicholaus, Beth Renaldi, Sol Robledo, Alexis Rueda, Irina Ruvinski, Joel Sanchez, Carrie Schuler, Kathryn Seckman, Wendy Dongwon Shon, Silvia Stangalino, Micol Werner, Kathryn Wilson, Mike Wincek, Vinita Wright, and Jason Zech. A special acknowledgment to Jill Arena, who used her incomparable creativity to envision a design for this book and then executed it with excellence. We are also grateful for our own wisdom sharers who helped us steer this project forward: Joellyn Cicciarelli, Maggie Lane, Terry Locke, Gary Jansen, Santiago Cortés-Sjöberg, Maria Cuadrado, and Vinita Wright. Most especially, we are grateful to Pope Francis for his vision for this project, his generosity in sharing his own life stories, and his deeply perceptive and appreciative responses to the contributors who shared their stories with the world. This book’s creation is also due in large part to Fr. Antonio Spadaro, SJ, editor of La Civiltà Cattolica, the international forum on religion and culture published in Rome. We thank him for his creative partnership throughout the project but especially for his wise and sensitive sessions working with Pope Francis that elicited His Holiness’s responses. And finally, we want to thank the young people who answered our call to share what they learned from an elder, the interviewers who sat down with a family member or acquaintance, and the elders who showed a vulnerability and willingness to share that opened vaults of wisdom and grace. We hope their words continue to inspire generation after generation.